Thanks to GPS and accelerometer that equipped in each and every iPhone, Nike+ GPS works outdoor and indoor, whether user is running on an open air trail or on a treadmill inside air-conditioning gym, without additional sensor. Runner can record the pace, distance and run route. The run route can be displayed on a map. 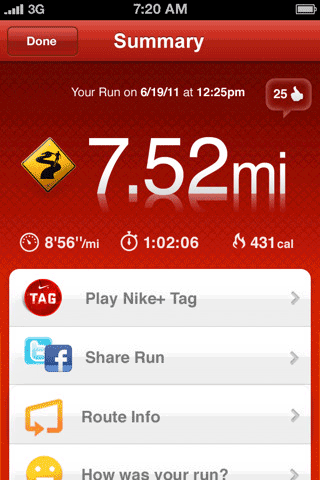 Nike+ GPS also has a unique feature called Cheer Me On, which cheer audio will be played in-run every time your Facebook friends like or comment on your run status which you decide to post through the app, or outrun them in a game of Nike+ Tag. Post run motivational and encouragement messages from Nike’s top athletes will also be played whenever you surpass yourself to set new record. Similar to most other GPS tracking app for sports enthusiasts, Nike+ GPS features voice feedback during mid-run to let you know how you’re doing, and allows music to accompany your run, including personalized PowerSongs for extra boost. The tracking data and accomplishments can be sent to Facebook and Twitter to share with friends, or nikeplus.com to join challenges, set goals and connect with Nike+ community. Nike+ GPS for iPhone app has a price tag of $1.99. To celebrate fifth anniversary of Nike+, the Nike+ GPS App is free for a limited time. In actual, Nike+ GPS has been late comer in the “price drop to free” category. Other popular fitness apps including RunKeeper and runtastic PRO had also reduced their prices to zero (free) for a limited time months earlier in order to increase awareness as well as increase user base and community. Download Nike+ GPS from iTunes App Store and start getting fit today. Nike+ GPS is compatible with iPhone 3GS, iPhone 4, iPad, iPad 2 and iPod touch (2nd, 3rd, and 4th generations) running iOS 4.0 or later, though iPod touch does not support GPS functionality and tracking may be a bit off.